People use this word in so many ways, you will be surprised. Often this term is used as opposite of ‘traditional,’ and the word of this style is form-follows-function, a phrase dear to the modernist movement founders of Bauhaus. Modern kitchens are open and airy with a very efficient-working triangle and good workflow. Freestanding appliances are replaced with built-ins to blend with the sleek, new streamlined cabinetry. The space is filled with highly efficient cabinets and updated hardware. As a rule of thumb in designing a modern kitchen, you will be looking for cabinets of similar width, symmetry, and a strong sense of organisation. Kitchen islands are a big asset to the modern kitchen; they open up the space and provide an eating area, extra storage, additional counter space for food prep, and socializing. 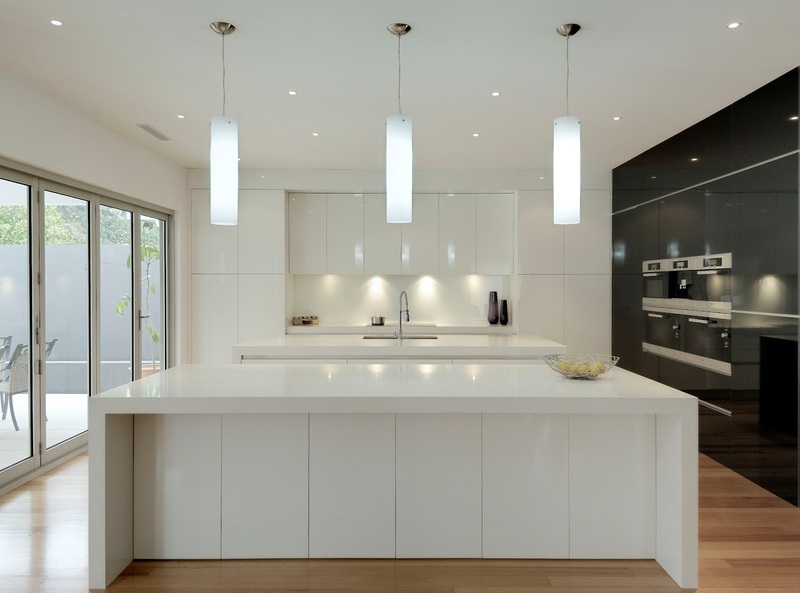 Modern countertops are simple and uncluttered. Common materials include stainless steel, concrete slab, quartz, glass, and granite. If the traditional countertop profile includes bull nose or double pencil, modern tops have straight edge in 20 mm, 40 mm, 60 mm, or 100 mm thick. Splashbacks are either large sheets of glass, stainless steel, or stone – easy to clean, sleek look, perfectly integrated in the whole composition. This is a sleek state-of-the-art kitchen with well-designed cabinetry and a harmonious flow of lines. Simple shapes with uniform sizes, well organized and elegant, functional and efficient. Photo courtesy: Urban Kitchens, Melbourne. The most used finishes in modern cabinetry include two-pack finish in gloss or satin, stainless steel, and veneer or laminate. The cabinetry is well-designed, with a harmonious flow of lines that are simple, uniform, organized, and elegant. A modern style connoisseur will be after a functional, efficient, sleek and state-of-the-art kitchen (Sachs, n.d.).